Steamroom heat. 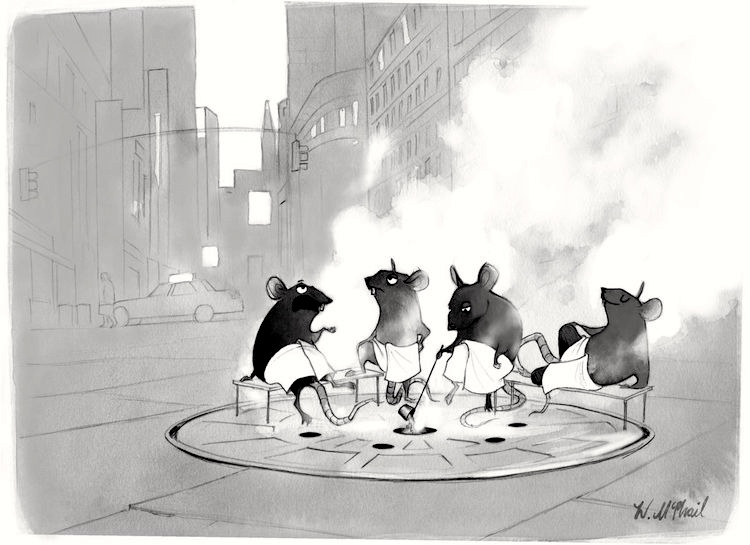 Understanding #1 requires, first, that you recognize the locale of the cartoon as the mean streets of a big city: note tall buildings; car in background; the central characters, which are rats, those urban scourges; and the manhole cover. Then there’s the steam rising from the manhole. A bit of cinematic atmosphere you’re unlikely to see in any city other than New York, and even there only in parts of the city. Details to follow. Finally, you need to recognize that the rats are in a steamroom, on benches, with towels around their waists. Well, actually, a sauna. Details to follow. In any case, the cartoon superimposes a sauna scene onto an urban street scene. The result isn’t ambiguous, but is simultaneously, surrealistically, both things at once. Con Edison, New York City’s venerable power company, pipes steam to customers in Manhattan just like any other utility product (such as gas, water, or electricity). The steam — some purposely created, some a ‘waste’ byproduct of electricity generation —comes from power plants. Commercial, urban steam systems of this size are rare, and New York’s is the world’s largest. (Lockport, N.Y., had the world’s first urban steam system, in 1877, and Denver’s is the world’s oldest in continuous operation.) NYC’s system has 105 miles of main pipes, 3,000 manholes, and reaches around 1,800 buildings — everything from the Empire State Building to United Nations Headquarters. Steam connections run from the southern tip of Manhattan to 96th Street on the West Side and 89th Street on the East Side. The [traditional Finnish] sauna featured a fireplace where stones were heated to a high temperature. Water was thrown on the hot stones to produce steam and to give a sensation of increased heat. Evolution. #2 is yet another version of the Ascent of Man cartoon meme (see the Page on evolution postings) — so labeled in McPhail’s drawing. 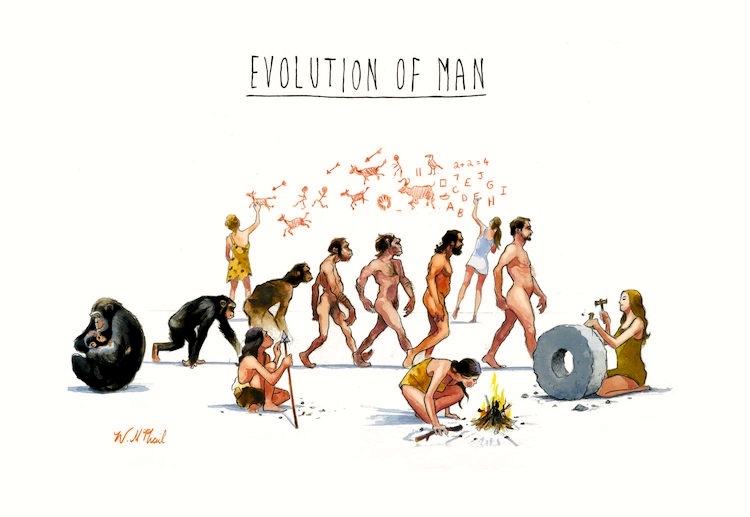 Which, however, plays on the ambiguity of man ‘human being’ (the sense intended in the literature on evolution) vs. man ‘adult human male’ — the sense shown in #2, where (presumably male) apes are seen evolving into men, while women make all the crucial cultural breakthroughs: tools, fire, the wheel, artistic precursors of writing. A wry viewpoint on the role of gender in the evolution of culture. This entry was posted on August 25, 2017 at 7:19 am and is filed under Ambiguity, Evolution, Language and gender, Linguistics in the comics, Understanding comics. You can follow any responses to this entry through the RSS 2.0 feed. You can leave a response, or trackback from your own site. I think we’re intended to see the ape nurturing the baby as female, too. Besides New York, Baltimore also has steam heating pipes running beneath the downtown streets. One blew up (most literally) a couple of weeks ago.